Almost imperceptibly weak, the hydrogen bonds in water make their presence known by occurring in numbers so vast that their presence cannot be ignored. As chemists, we all know that they are responsible for the relatively high boiling point of water, for holding trees up and countless other examples. But here is a new one: they allow hurricanes occurring on one end of the continent to be detected on the other end through seismological measurements. Skeptical? I was too at first when I read this news release: Superstorm Sandy shook the Earth" (open access). "When Superstorm Sandy struck the United States on 30 October, it didn't just devastate the Eastern Seaboard, it shook the ground as far away as the West Coast, producing tiny vibrations in Earth's crust that were picked up by seismometers there." At first I thought that the signals were being formed from the crashing waves on the shoreline, but that is only part of the signal that the researchers were detecting. "While some of the motions were produced by surf pounding beaches, a larger fraction came from large storm waves far offshore that smashed into each other." So how is it that possible in a viscous fluid like water? Recall that the effects of surface waves are practically imperceptible more than a few meters beneath the surface due to viscous dissipation. The critical clue to the answer is provided in this sentence: "The ground motions generated by strong storms over the sea typically cycle at low frequency...". Low frequency. That's important. Late last summer I blogged about a research paper that made measurements of the viscoelastic properties of water. This plot from that paper shows the frequency dependence of the storage and loss moduli. 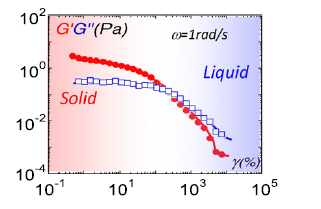 As with most viscoelastic materials, at low strain rates, the material is more like a solid than like a liquid (G' is greater than G"). That all arises from the hydrogen bonding that exists in water. Without it, the viscous elements would dominate and the storm signal would be quickly lost. Sadly, this same phenomenon also allows for the occurrence of tsunamis, waves that also occur at low frequencies. Incredible as it may seem, hurricanes can induce earth movement across a continent, all due to hydrogen bonding in water.